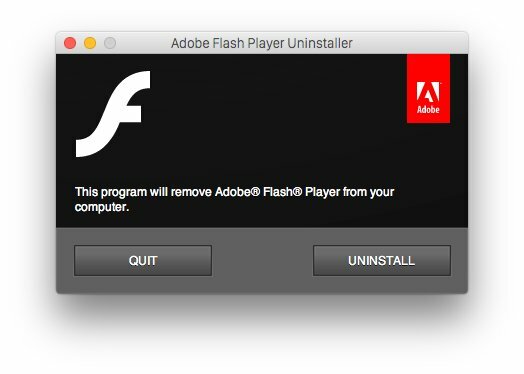 TL;DR— If you're running OS X 10.6 or later, download and run this Flash uninstaller. If you have OS X 10.4 or 10.5, use this uninstaller instead. Adobe has patched more than twenty Flash vulnerabilities in the last week— some of them days after active exploits were discovered in the wild— and issued over a dozen Flash Player security advisories since the beginning of this year. Flash has become such an information security nightmare that Facebook's Chief Security Officer called on Adobe to sunset the platform as soon as possible and ask browser vendors to forcibly kill it off. Though most exploits are targeted at Windows, Mac users are not invincible. Thankfully, Flash is easy to remove and most of your favorite sites and Web services will continue to work fine without Flash installed. YouTube, Netflix, and a host of others have either made the shift to HTML5 video or use alternative technologies, like Microsoft's Silverlight. Verify your OS X version by clicking the Apple icon in the upper left and selecting About This Mac. For OS X 10.5 and later— Snow Leopard, Mountain Lion, Mavericks, or Yosemite— download and run this uninstaller. If you find yourself with absolutely no choice but to use Flash— maybe you have a Flash-based business application— the safest course of action is to install Google Chrome. Chrome includes a special version of Flash that runs inside a sandbox, with updates handled by Google. If you can't or won't install Chrome, a good fallback is Marc Hoyois's ClickToFlash plugin for Safari. It will prevent any Flash content from running until you explicitly authorize it by clicking a placeholder in the page. If you insist on keeping Flash installed and won't use ClickToFlash, at the very least make sure Flash can update itself automatically by enabling automatic updates in System Preferences → Flash Player. Then perhaps you should take a long, hard look at your life choices.